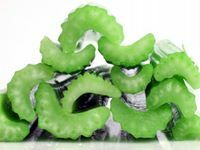 It’s been said that the Kiwi Fruit tastes like succulent green sherbet. It’s a delicious addition in fruit salads, green salads, juices and of course an exotic decoration for cocktails. Sweet And Juicy: Kiwi Fruit helps remove excess sodium from the body. The Kiwi Fruit originates in China and was taken to New Zealand by Chinese missionaries to start growing trials. It was originally known as the Chinese gooseberry and the New Zealanders then named it the Kiwi Fruit. It is also known as the Hayward Kiwi. In the 1970’s, commercial cultivation began and the growing trials made it possible for growing kiwi fruit in other countries. It’s a vigorous climber with separate male and female plants needed to produce the luscious fruit. Kiwi fruit require full sun for growing and thrive in richly composted, deeply dug and well watered soils. Ideally, male and female plants are planted together about 1meter apart on sturdy frames or arches or wire rows. Kiwi plants require light pruning and protection from frost. In very cold areas, kiwi plants will not survive. The Kiwi Fruit is rich in vitamins C, E and A. It contains dietary fibre, potassium, phosphorous, magnesium and copper. It has a remarkable ability to remove excess sodium from the body which is good for the average person who eats too much salt. The Chinese believe that it’s the tiny black seeds that perform this amazing feat. The Kiwi fruit is also rich in antioxidants and digestive enzymes. 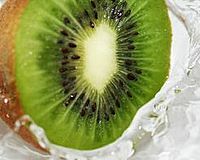 Kiwi fruit should be eaten as soon as possible after being cut as these enzymes make the fruit go soggy. It’s a great fruit to add to your detox diet juicing recipes because its a good source of vitamin C.
To test for ripeness: apply gentle pressure with the thumb, the flesh ofthe fruit should give way. Don't usse fruit that is over-soft, bruised or shrivelled. To speed up ripening you can place the kiwifruits in a brown paper bag with an apple or banana. Ripe kiwi fruits can be placed in the refrigerator.